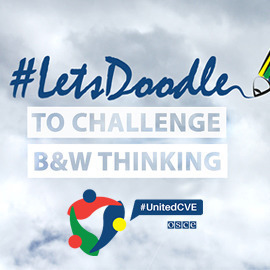 Pick up your pen and help OSCE challenge violent extremism! #Letsdoodle! In 2015, the Organization for Security and Co-operation in Europe (OSCE), the world’s largest regional security organization with 57 participating states in North America and Eurasia, launched the “OSCE United in Countering Violent Extremism” communication campaign (#UnitedCVE). The OSCE would like to highlight how cartoons can help express positive messages that challenge violent extremism. Can you help the OSCE create powerful counter-messages against violent extremism in the form of a cartoon? FORMAT: Description of the character(s), 1-3 situation sketches, a poster with a tagline. Send us your entries before June 19, 2016 23:59 UTC ! Good luck!